Epiphone and Gibson have been innovators in electrifying traditional stringed instruments for almost a century. 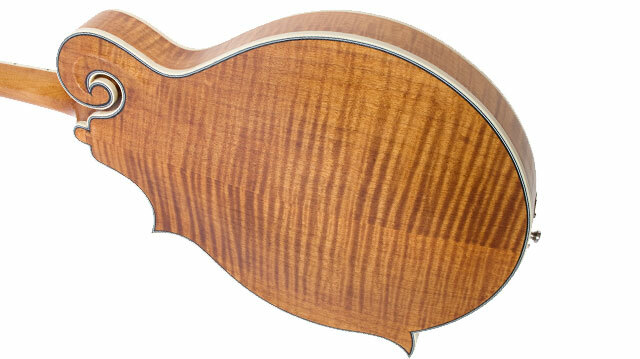 Lloyd Loar, one of the Kalamazoo Factory’s legendary designers and innovators, incorporated a pickup into the pickguard of his own 1922 F-5 mandolin. With Loar’s designs in mind, Epiphone continues that tradition of innovation and has created a unique pickup and preamp system in collaboration with Shadow Germany for the MM50E. The MM-50E features the classic f-style shape including a carved, Solid Spruce top with a traditional flame maple back and sides, and a SlimTaper™ “C” profile hand set maple neck. The MM-50E is finished in beautiful Vintage Natural (VN) using a hand-rubbed poly-oil finish that is “50% sheet, which not only makes for a striking look but is also thin enough to allow the Spruce top to resonate and show off the tonewood’s subtle characteristics. The maple neck includes a fingerboard with classic dot inlays along with a pearloid "Flower Pot" inlay on the headstock that pays tribute to Lloyd Loar's original "F" style design. The MM-50E’s unique Shadow electronics system puts all the electronics inside the pickguard, allowing you complete control of your electric tone without adversely affecting the F-style mandolin’s acoustic tone. The MM-50E’s ground breaking electronics feature Shadow Germany’s “Quad” NanoMag™ pickup, a unique low impedance humbucker pickup designed in collaboration with Epiphone luthiers. 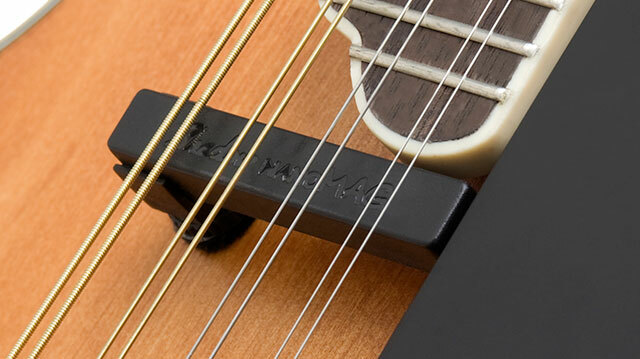 The pickup is equipped with samarium-cobalt magnets that capture true acoustic tone with a wide range of harmonics. Under each string pair is a separate "coil" that only picks up the sound of that string pair, with crosstalk separation of >85dB! Each of the 4 output levels is controlled by 4 trimpots discretely accessible from the top of the pickguard via a mini flathead screwdriver. Once set to your desired levels, typically you would never need to adjust the levels again. 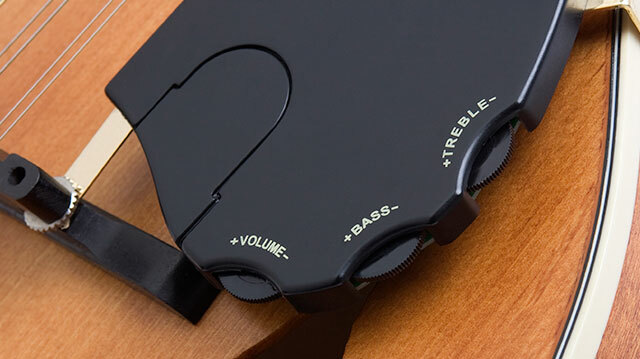 This allows the mandolin to respond and sound just like an acoustic mandolin should. The pickguard features separate rotary master volume, treble, and bass controls as well as an easy-access battery compartment for the light-weight, long lasting 2032 watch-style lithium battery. For added versatility the NanoMag can slide back towards the bridge for a brighter tone or forward towards the neck for a warmer tone and anywhere in-between, allowing you to position the pickup for the optimum location for your picking style and stage sound. Vintage mandolins suffer from the wear and tear of a century of playing and the hardware often suffers the most. The MM-50E really shines with nickel tuners with vintage style white pearloid buttons and a traditional nickel tailpiece cover designed at Epiphone in Nashville, TN.